Welcome to The Abso!ute Sound online! We explore music and the reproduction of music in the home. We believe that the sound of music, unamplified, occurring in a real space is a philosophic absolute against which we may judge the performance of devices designed to reproduce music. Our goal is to provide the resources consumers need to judge how a component's sound either honors or departs from the music's truth, and to make sound purchasing decisions that maximize their experience of reproduced sound. Below is our Issue 232, April 2013 table of contents and editorial. 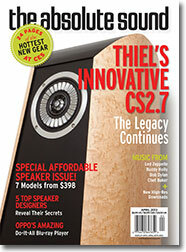 35 The 2013 Consumer Electronics Show: Twenty-six pages of the finest new gear from CES. Five of the world's foremost loudspeaker designers weigh in on what makes a great small speaker great. Chris Martens listens to three appealing and affordable loudspeakers, the Definitive Technology Studio Monitor 45, CEntrance Master Class 2504, and GoldenEar Aon 3. 22 Oppo BDP-105: Oppo outdoes itself with this new audiophile-quality "play-anything" Blu-ray universal disc player and DAC. Chris Martens reports. Paul Seydor finds much to like in his mini-survey of three different-sounding, mid-priced pickups: the Ortofon Cadenza Bronze, Clearaudio Talisman V2 Gold, and Benz Zebra Wood Low. Neil Gader on the big brother to Sonus faber's Venere 1.5, our recent Loudspeaker of the Year winner. Find out why Harbeth's new Monitor 30.1 has become Paul Seydor's favorite small speaker. Robert E. Greene on a sterling new Danish loudspeaker with a radical new motor structure that greatly reduces odd-order harmonic distortion. New TAS writer Ron Doering speaks from experience when he says Ayon's new mid-priced integrated amplifier is a big step up from the entry-level competition. Vitus Audio of Denmark lowers the barrier to entering the ultra-high end with its most affordable product yet, the 300Wpc RI-100 integrated amplifier. Neil Gader has the details. Thiel's revolutionary Coincident Coaxial Driver technology has trickled down to the mid-priced CS2.7. Anthony H. Cordesman reports. 138 Wagner in HD: Andrew Quint explains how Wagner's music benefits from high-resolution multi-channel technology — and recommends the best recordings now available. 144 Download Round-Up: AQ on recent high-res classical downloads of Beethoven, Mahler, and Chesky. 146 Rock: The latest from Led Zeppelin, Cody Chesnutt, Maria Muldaur, Petra Haden, Old Man Luedecke, and Tim "Too Slim" Langford; audiophile reissues of Bob Dylan and Buddy Holly. 152 Classical: New collections of music for Holy Week, early Tchaikovsky symphonies, and Jacques Charpentier's Karnatic Etudes, along with XRCD reissues of classic performances under Beecham and Previn. 156 Jazz: Dazzling new releases by Hiromi, Ben Goldberg, and Kurt Rosenwinkel; stellar vinyl pressings of Chet Baker and Jackie McLean. We talk to Mark Waldrep of AIX Records.